Bubba, this adorable little Cushy Critter stuffed buffalo, is ready to roam the earth with you. With soft light brown fur, brown accents, and cute little black horns, sweet Cushy Critter plush buffalo Bubba wants to be your next best friend. He even has an elastic loop making him great for taking along on adventures by simply looping it around your finger. This product is really cute! The loop on the top is handy and he is weighted at the bottom! I recommend this to future buyers. Plains, this cute little stuffed buffalo has soft and shiny, short and shaggy brown fur, a black leather-like nose, and fun felt horns. Snuggles-Ups sweet stuffed buffalo Max Jr. is all snuggles and hugs with soft brown fur, light brown and black accents, and fun horns. 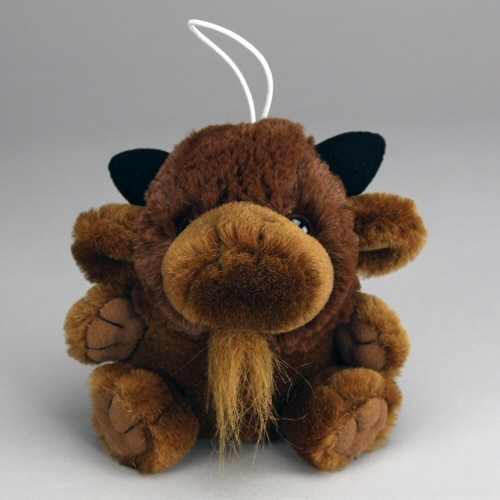 This adorable little buffalo plush keychain has soft brown fur and fluffly beard, mane, and tail tuft. This adorable plush bison clip-on has soft light and dark brown fur, fluffy mane and tail tuft, and fun horns. Home on the range has never been so much fun as it is with this adorable Handfuls stuffed bison. Molly, this adorable little Cushy Critter stuffed moose, has soft brown fur, attentive antlers, and a big, sweet face. Benny, this adorable little Cushy Critter stuffed beaver, has soft brown fur, light brown accents, big white felt teeth, and a fun, floppy tail.